German banker; born 1812 at Baiersdorf near Erlangen; died June 4, 1885, at Munich. 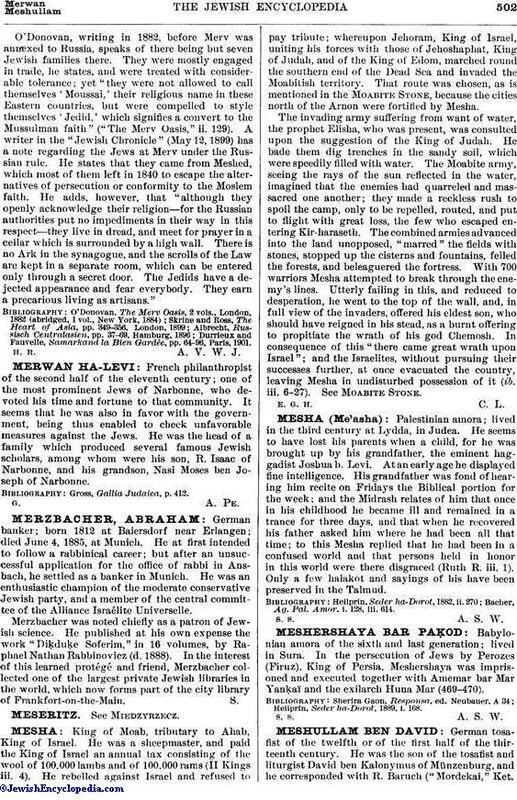 He at first intended to follow a rabbinical career; but after an unsuccessful application for the office of rabbi in Ansbach, he settled as a banker in Munich. He was an enthusiastic champion of the moderate conservative Jewish party, and a member of the central committee of the Alliance Israélite Universelle. Merzbacher was noted chiefly as a patron of Jewish science. He published at his own expense the work "Diḳduḳe Soferim," in 16 volumes, by Raphael Nathan Rabbinovicz (d. 1888). In the interest of this learned protégé and friend, Merzbacher collected one of the largest private Jewish libraries in the world, which now forms part of the city library of Frankfort-on-the-Main.